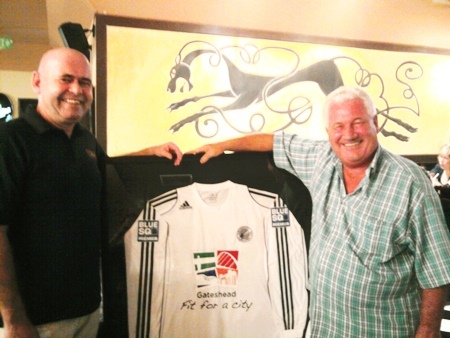 Stewart Fraser of Shenanigans Irish Bar in Jomtien, left, is seen with former Gateshead goalkeeper George Alberts, who lives in Thailand, with a backdrop of a framed Gateshead Football Club shirt brought over by Laurence Dinning one of the club’s sponsors. Gateshead, who are currently members of The National Conference league in England, are two games away from a Wembley appearance in The FA Trophy. George, who played under two managers at Gateshead in the 1960’s (former Newcastle winger Bobby Mitchell, and George Hardwick of England and Middlesbrough) was delighted with the presentation and remarked that another former Gateshead player Tom Callender, who played 432 games for Gateshead in the old 3rd Division (North), had once been described by the late Nat Lofthouse as one of the best centre half’s he had played against. Bolton beat Gateshead 1-0 in an FA Cup 6th round tie in 1953 on their way to the final against Blackpool.